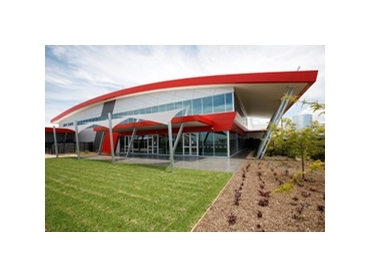 The Australian Institute of Building have awarded Vaughan Constructions the 2010 National Professional Excellence in Building Award for Commercial Construction $10m - $50m category, for the Coca Cola Distribution Centre at Eastern Creek, NSW. The Coca Cola Distribution Centre at Eastern Creek comprises 32,546 m² warehouse, office space for 75 people, including canteen with full commercial kitchen, car parking, large truck parking area, and extensive truck manoeuvring and dock loading areas. Vaughan Constructions was selected by Goodman International as the Design & Construct builder based on their team, their understanding of client expectations, experience in successfully delivering projects on time, and their commitment to “environmentally friendly” design. The building presents a modern form shaped to portray a 21st century business. Strategies employed by Vaughan’s aimed to achieve a building of a four-star rating for industrial buildings from the Green Building Council. The strategies implemented in the project have been used in establishing the “Industrial Green Star Rating Tool”, with the project being a “Pilot Green Star Project”. The project was delivered with minimal inconvenience to both Goodman as the owner, and Coca Cola Amatil, as the tenant. Both companies capitalized on Vaughan’s 55 years of design and construction expertise, fusing together yet another landmark facility.